SellAnyMobile.co.uk is the fastest and easiest way to sell a used, new, non working or even broken Apple Watch Nike Plus Series 3 42mm GPS Space Grey Aluminium for cash if you like to trade in or recycle. Price compare trade-in and cash offers from over 1 different UK based online recycling websites. 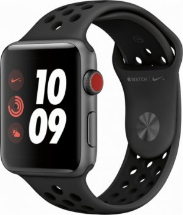 With sellanymobile.co.uk double your value comparing as our users gets up to 60% more value for their Apple Watch Nike Plus Series 3 42mm GPS Space Grey Aluminium if they compare prices with recyclers listed on our website. Few things to bear in mind before you sell your Apple Watch Nike Plus Series 3 42mm GPS Space Grey Aluminium to any of the recycling websites listed on comparison chart of sell any mobile. Wipe your data before you post out your Apple Watch Nike Plus Series 3 42mm GPS Space Grey Aluminium. You can get up to £130.00 today if you trade in your Apple Watch Nike Plus Series 3 42mm GPS Space Grey Aluminium with Music Magpie recycling comparison website. There are 7 more recyclers who are paying cash today for Apple Watch Nike Plus Series 3 42mm GPS Space Grey Aluminium. All you need to do it simply visit their website and complete easy to use checkout process to send your device to them in return for cash. You have a number of choices when it comes to selling your Apple Watch Nike Plus Series 3 42mm GPS Space Grey Aluminium. You could sell your used, new, working or even faulty Apple Watch Nike Plus Series 3 42mm GPS Space Grey Aluminium mobile phones to & Music Magpie recycling. You could sell your mobile for cash or voucher when you trade in. Or, you could make the best decision: and sell your mobile phone with Music Magpie as they are paying the top price for this model. Not only did we select the best recyclers in term of prices but also in term of the customer experience they provide. Our partners are very professional and pay fast. Sell your Apple Watch Nike Plus Series 3 42mm GPS Space Grey Aluminium and use the free Free Shipping method so you dont have to pay a penny. When you trade-in your Apple Watch Nike Plus Series 3 42mm GPS Space Grey Aluminium by comparing it on sellanymobile.co.uk, you aren’t paying for shipping. Recyclers will send you a postage paid package or let you print off a prepaid label. Simply slide your mobile device into the package, seal, and place in the mailbox or wait for their courier to arrive! When you sell to individuals, you are usually paying shipping out of your own pocket, which decreases the amount you earn from the sale of your Apple Watch Nike Plus Series 3 42mm GPS Space Grey Aluminium. It’s Easy to Sell Your Apple Watch Nike Plus Series 3 42mm GPS Space Grey Aluminium for cash. Selling your Apple Watch Nike Plus Series 3 42mm GPS Space Grey Aluminium mobile phone can be tricky and finding the best trade in deal lengthy. Sell Any Mobile has worked hard to make the process of selling your Apple Watch Nike Plus Series 3 42mm GPS Space Grey Aluminium or any other mobile phone or tablet as simple and painless as possible for you! Visit our website www.sellanymobile.co.uk, find your device by searching the name on our easy to use and efficient search bar, choose the correct model of your phone that you wish to trade in and your work is done. Simply select the recycler listed on the product page such as Music Magpie recycling for this model as they are paying 130.00 for this mobile for trade in. Have a look at some of your options below and choose the most suitable recycler as Each of these companies has different terms for their trades, so be sure to read closely and ask questions before parting with your Apple Watch Nike Plus Series 3 42mm GPS Space Grey Aluminium but this can be a great way to get that new gadget you crave while also paying a bit less for it.